Written by Kate Dommett and Luke Temple. Digital technology is now central to political campaigns and in the 2017 General Election we think there were two developments that have important implications for UK politics. The first was the developing role of Facebook. The second concerns what we describe as ‘satellite campaigns’. Both of these complicate election regulation law, and raise questions about whether parties still have control over their campaigns. A key component of the 2017 election strategies was parties’ increasing use of Facebook (building on the 2015 Conservative campaign). Recent studies have suggested that political messages shared on Facebook, especially those shared ‘organically’ between friends and family, can be effective. Seeking to promote and benefit from this trend, political parties made extensive use of the platform. Using demographic, location, and ‘Like’ data offered by Facebook, and supplementing this with information they collect themselves, parties used Facebook to ‘micro-target’ advertising for very specific audiences. During the election much was written about parties’ use of Facebook to push “dark ads”, but less contentious content such as voter registration material and polling day reminders were also pushed. There is clear value for parties in understanding what types of adverts win them support or motivate people to vote. But we argue there are also wider social implications of this use of technology that need to be considered. Specifically, we do not yet know how aware voters are of political targeting and whether they’re comfortable with it. Whilst we might be used to targeting by commercial companies, politicians are held to higher ethical standards. Extensive use of personal data for political purposes might not sit well with citizens. And so whilst Facebook advertising may deliver parties short-term returns, in the long-run it could damage public trust. Any concerns citizens have are also likely to be made worse by problems with existing regulation. When applying rules on, for example, party spending to the online environment, difficulties arise. This is because Facebook advertising can blur the boundary between national and local campaigns, making it unclear at what level spending should be declared (and therefore whether local spending limits have been exceeded). Resolving this kind of issue will not be easy, but it is vital to think about public views and regulations if this use of digital technology is not to have long-term negative consequences. Dissecting the failings of the Conservative 2017 election campaign, Mark Wallace, editor of Conservative Home, recently observed how numerous disparate groups aligned to Labour are able to spread the Labour message. These groups had the important bonus that “people are more likely to trust a message from a group which is (at least nominally) outside the orbit of a party HQ, and which they’re engaged with in their regular life outside election time.” In a nutshell, Wallace has picked up on what we have labelled ‘satellite campaigns’. This type of activity has always been possible (think of Militant in the 1970s and 80s), however digital media vastly reduces the resource costs required for new satellite campaigns to form and bring people together. Some campaigns are non-partisan and focus on wider democratic issues such as voter registration and turnout (i.e RizeUp), or linking together crowd-funding projects and activists (CrowdPac). But many are highly partisan. The digital platform Campaign Together allowed activists to organise and strategically canvass in marginal seats. One key part of this was activists canvassing across party lines to try and overturn Conservative majorities or protect seats at risk. In 2017 this sort of information and organisation become easier to access than ever before, with applications such as Momentum’s ‘My Nearest Marginal’ providing straightforward information on where canvassers could go to fight seats (for the Labour Party). ‘I think why people got involved with campaign tools like Campaign Together and what Momentum were offering is because a lot of people, and I heard this from talking to people, were similar to me in that they were intimidated to go to [party] meetings or they didn’t enjoy them and they found it hard to get involved and they wanted to – this felt like something autonomous or indirect’. Satellite campaigns therefore seem to be changing the way people get involved in party campaigns, with online tools allowing people to get involved in a more organic, individualised way. At one level, this could have huge benefits for parties, offering a reserve army of new volunteers, but it has other consequences. With many more people involved, and different organisations beyond parties playing a role, parties’ ability to stay in control of their messages is under threat. 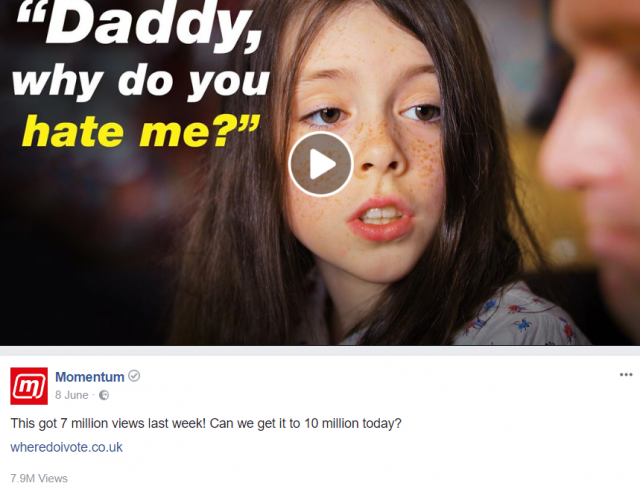 Satellite campaigns in 2017 resulted in material such as Momentum’s ‘Daddy, Why Do You Hate Me?’ which gained around 7 million views over the campaign period – yet the tone of the video is one unlikely to be sanctioned by any official campaign. Whilst these materials can have positive effects, they can also backfire, with unknown consequences for official party campaigns. Parties will have to think about how they work with these ‘orbiting’ organisations to try and tap into their energy and resources, without stifling the very characteristics that makes them attractive to new activists. Yet, perhaps most important, satellite campaigns also raise important questions about the regulation of digital campaigns. As with Facebook, they raise questions about the boundaries and appropriateness of current finance regulations. If satellite campaigns become important (yet autonomous) parts of parties campaigns, then should their activity ‘count’ towards parties official expenses? If not, is there a danger that UK politics could become Americanised, with expensive and yet undeclared ‘external’ campaigns? These questions suggest that we cannot ignore the implications of digital campaigns and need not only to understand, but also to act in response to fast-paced digital change. General Election 2017: Will Wales wake up feeling blue on June 9th? Negative Campaigning Does It Help Or Does It Hurt? Previous Post Young voters and their “never Tory” mindset: the making of a Labour generation?